Coding explained by Maxwell and Peter, 15 from Fife. 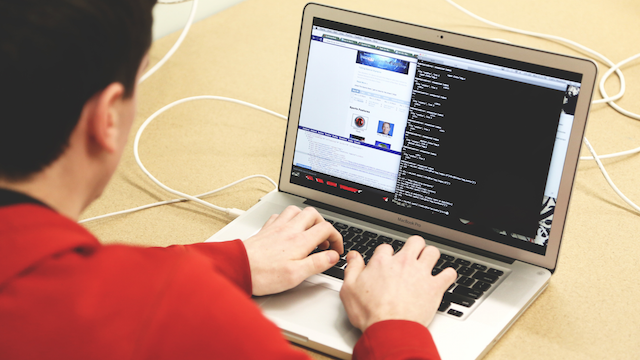 Coding is difficult and takes time to learn but it can be extremely valuable. All over the world there are different languages and it’s exactly the same with Code. It’s important to understand that computers talk to each other in different languages. With the right code and enough time and practice you’ll be able to develop apps, games, websites for all kinds of technologies. So for example, if you want to make an app that tells you about animals for your iPhone, then you’ll need to learn Cocoa, the language of Apple. And if you want to create a game where you play as an animal in your own world, where you can run around, then you need to learn Python! Want to create a website about animals? Use a combination of HTML and CSS. Both of these are vital to the structure and design of what you want to develop. Scratch is one of the easiest programs to learn, using blocks it easily shows you what will happen in a precise order. Like other coding languages, it is a simple case of dragging and dropping blocks into scripts. Each of these blocks can be customized to give a precise command, for instance, ‘When ‘Right Arrow’ is pressed’ and ‘Change x by 10’. This small bit of code will change its position on the x coordinate by 10. So with a bit of work, you could have a sprite (character) moving about the screen. You’re then well on your way to making a game! Max is developing a game called PixelBrawl where you can fight with characters of you choice. To be able to make sure the players can attack each other and even make sure they move along the ground is hard. Nothing is easy in coding and because of that alone it’s always amazing when you can play or use the final product of all your hard work. We also made our own website using the webs website. To see an example of how we used it, you can visit the site we created. Grog is a weather app that we have developed. It is simple but smart and is designed to allow the user to access the specific weather forecast for the day and place that they want. You can email mailto:tsewnosliwappinventors@gmail.com to make sure all the places you would like to be included in the app are added. Now available on the Android App Store! Mole Masher is an updated version of the game app designed for the Curriculum for Excellence course Computing Science. We have added different levels to the game to allow users to increase the level of difficulty if and when they wish. You can take your mole to different terrains as your increase your difficulty. This game saves your High Score for you and challenges you to beat your own personal best. Download Mole Masher to unlock hours of fun. Now, moving blocks on a screen is quite fun, but coding isn't all colourful blocks! In our Computer Science course, after working on both Scratch and MIT App Inventor, we moved onto an application called ‘TrueBasic’, a simple text editor which transforms your text into a program. That’s right; we began to work like a REAL programmer, which means back-to-basics text and numbers. Instead of dragging a block from your list such as ‘Say Hello!’ you’ll be typing ‘PRINT “Hello!”’ which might not sound too difficult, but you’ll probably be doing a LOT more typing than you are used to. Unfortunately, the image you can see above will be the kind of style that you will be presented with when programming. No colour, just black and white text. With this program, we have only made text applications and text adventures, none of which are terribly exciting compared to Scratch and App Inventor. Though after this you can choose what you want to move onto. It completely depends on what you want to develop a game or program for. Python or VisualBasic (aka VisualStudio) would be your next step for computer programming and if you wanted to develop your Android app further, you could learn Cocoa to take you app onto the Apple App Store. Or you might want to develop a game for the Xbox 360 with XNA and VisualStudio. The choice is yours! We’re going to stick with mobile devices and continue App Inventor and I’ll get on with learning Cocoa, but otherwise, happy coding!